There’s a canny, twisting circularity to this bold new version of Chekhov’s gloomy masterpiece. In an early conversation between lovesick young writer Konstantin and his uncle Sorin, a throwaway reference is made to Escher – master of the impossible image. As the play progresses, this glancing allusion becomes something of a metaphor; as in the artist’s famous staircases, Chekhov’s melancholic characters climb only to descend, walking round in hopeless, navel-gazing circles until the paradox of existence itself becomes inconceivable. Here the beautiful is also entrapping, leading to a dead end or a sharp drop. Headlong’s take on The Seagull was never going to be blandly traditional, but this new interpretation by playwright John Donnelly and director Blanch McIntyre injects Chekhov’s play with impressive vigour, achieving the often promised but rarely delivered feat of rendering a classic totally fresh. The production applies a new lens to the text by wisely resisting the urge to wrestle it into contemporary trappings – the troublesome horses are still firmly present, alongside vaguely modern dress – instead embracing its vaunted timelessness. Much as the Young Vic’s recent version of Ibsen’s A Doll’s House lightly played with temporality, displacing the narrative enough that it could seem somehow both period and contemporary, Chekhov’s characters are knocked out of their time. This temporal displacement works across direction and design; Laura Hopkins’ empty grey shell of a set, virtually robbed of visual reference points, could almost be the post-apocalyptic landscape described in Konstantin’s play, the occasion for which Chekhov’s cast of ennui-stricken bourgeois characters are initially gathered. Throughout the romantic entanglements and artistic trials that follow, a long seesaw becomes the striking centrepiece of the stage, visualising the delicate and ever-shifting balance between the various characters. As one individual ascends, another is dumped unceremoniously back to earth. As well as drawing attention to its own fragile equilibrium, this production is self-aware in other ways. McIntyre’s approach is deeply concerned with the latent theatricality present within the metabolism of the play, making the characters – in particular the aspiring young artists Konstantin and Nina – sporadically conscious of their own appearance before others, turning to address spectators in sequences that raise the house lights on the audience. Writing, meanwhile, leaves its physical trace on the back wall of Hopkins’ set, vividly animating the act of invention that sits at the play’s core. Essentially, McIntyre reveals this as a play about art, about how the artist sees both themselves and the world. These particular artists, however, are frequently unlikable in their existential angst, schizophrenically veering between egotistical vanity and brittle, crippling despair. In one pivotal scene featuring Gyuri Sarossy’s quietly self-absorbed Trigorin, the writer’s mental masturbation is strikingly paired with its physical counterpart – a wanker in every sense – as he brings himself to climax while Irina hails him with a verbal assault of praise. Alexander Cobb’s whining Konstantin is little better, weakly reaching for a transcendental ideal that is quickly overshadowed by jealousy, while the excellent Abigail Cruttenden as his narcissistic mother incessantly struts, preens and flirts, the consummate actress in love with her own performance. 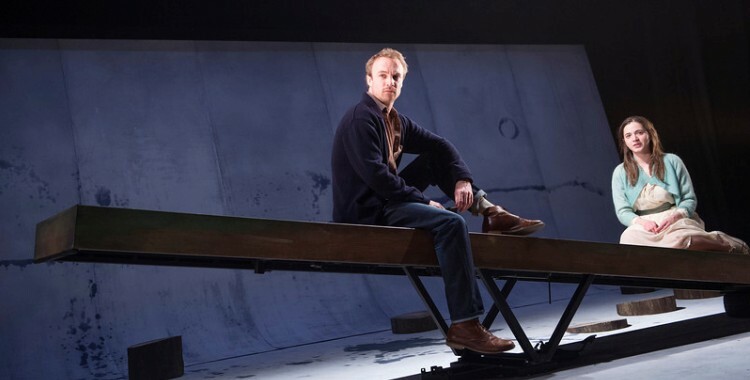 For all that stultifying stasis is foregrounded – stillness is central to the make-up of the scenes, while McIntyre is a director unafraid of onstage silences – there remains a certain muscularity to this production, a momentum beneath the lethargy. This is largely down to the vital aggression of Donnelly’s text, fuelled with much the same expletive-laced energy as Benedict Andrews’ revelatory, vodka-drenched Three Sisters, yet equally capable of subdued introspection. Chekhov’s characters might be in love with talking, favouring philosophising over action, but here no words feel wasted. As one character sardonically puts it, “there’s an art to tedium”, and it’s one that this production masters with fresh, fierce, invigorating intelligence.